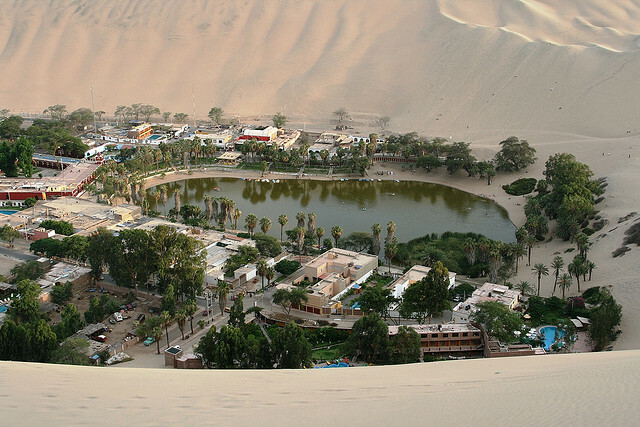 Huacachina is a small village in southwestern Peru and it’s called the “Oasis of America”. The small, natural lake at the center of the small village is completely surrounded by desert. Local myth and legend describes the start of the lagoon coming when a beautiful native princess conjured it. She was attacked by a young hunter while bathing in it and she fled, leaving the pool of water. The dunes were created in her wake while fleeing, stopping the man from following. It is rumored that the princess still lives in the oasis as a mermaid. The oasis has been popular as a local vacation destination for many years but only recently have international tourists discovered this hidden gem. Sandboarding and dune buggying are especially popular in the area as the village sits directly between paradise and desert. In addition to the qualities that it holds in the small area it also is only an hour from the Pacific coast and will direct bus lines from Cusco, Arequipa, Nazca, Paracas, and Lima you can make a stop at the tiny village a day excursion. In the lagoon you can hire paddle boats or row boats to sail out into the middle of the small lake and be totally surrounded by lush palm trees and greenery with rings of desert lining the horizon in all directions. You can also swim in the lagoon as the waters are naturally warm under the hot desert sun but considerably cooler than the air as a mid-day activity. This desert oasis is like a mirage because it suddenly pops up as a moment of refreshment in a vast, dry desert. However, unlike a real mirage the closer you get you see that your eyes have not deceived you; the beautiful, small bit of lush heaven does really exist.